This option helps the user to store the Fixed Deposit details i.e. the name of the holder, the name of the joint holder, the name of the nominee, the fixed deposit number, the name of the scheme, the name of the agent, the date of the F.D, the amount, the type of deposit i.e. whether it is in a company or bank, the type of interest i.e simple or compound and in case of compound interest, whether compounding is to be done on monthly, quarterly, half yearly or annual basis, the period of fixed deposit i.e. if it is for some months or for some days, the maturity date and the maturity amount. [Calculate] button is given for calculating the interest, maturity value and maturity date of the F.D. [Renewal] button is there for putting the details on renewal of the FD. Now you can enter maturity and Interest entry direct in Maturity Option. Holder Name Select name here from list. Join holder name 1 Maximum length is allowing 40 characters. Join holder name 2 Maximum length is allowing 40 characters. F.D. With Maximum length is allowing 25 characters. Agent Maximum length is allowing 40 characters. F.D. No. Maximum length is allowing 15 characters. F.D. Amount Enter Amount here. Form Select Form of F.D. here. Deposit Type. Select deposit type here. Nominee Enter detail of nominee here. Int. receivable Select entry from list. Interest Recd Select entry from list. Interest Type Select entry from list. Compounded Select entry from list. Int. Rate. Enter rate amount here. Maturity date (Date) Enter maturity date. Calculate (Button) Click here for calculation. Bank Name Maximum length is allowing 40 characters. Payment Type Now you can add direct account entry from here select payment type of FD. Ref.No/Cheque No Receipt or cheque no of payment if bank enter here. Account Name Select payment account. 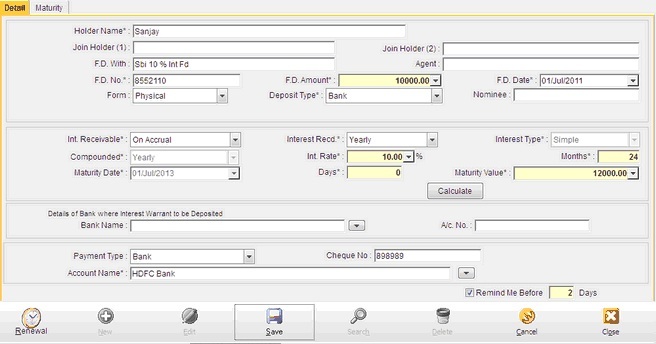 Maturity : This is new option to enter maturity and interest transaction entry. 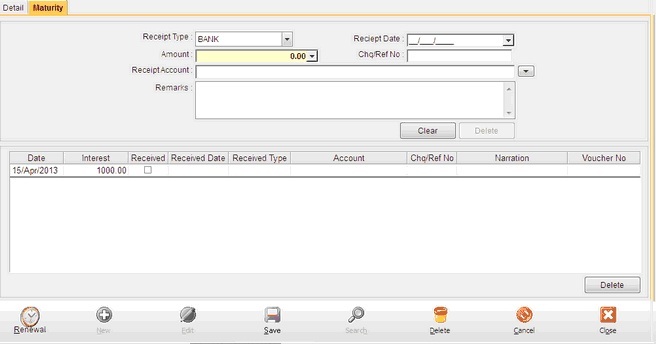 When you select account in mature fd entry then other detail, like receipt date,amount automatically fill from transaction. In interest receipt entry you have to check mark as received and specify received date,type of transaction like,bank,cash,jv(Other),select account from list,enter narration. Here also delete interest received transaction with delete button or uncheck received option.